Below Ground & Basement water leaks are expensive & complex to rectify. Registered Building Practitioner & Specialist Waterproofer. Basement waterproofing by applying Liquid Rubber and Arma-Blue protection sheet. The recent Australian construction boom has resulted in an unprecedented number of multi storey apartments & commercial construction. Many of these buildings involve basements for underground car parking, storage, and utility areas. However, an unfortunate consequence is evidence of an alarming increased frequency of building defects – and the most common of these defects is water leaks. Of all the water ingress possibilities, the consequences of basement water leaks can be the most expensive and complex to rectify - often resulting in devastating & costly damage. For commercial buildings, water leaks can ruin expensive equipment and disrupt business while in the case of residential buildings this can result in damaged finishes and furnishings. Basement leaks add up to lost money, wasted time, upset customers and sometimes expensive litigation. 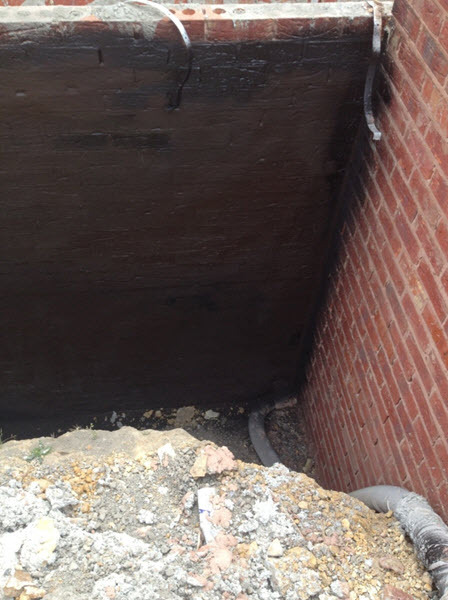 Leaking basements & foundations may comprise the structural integrity of the entire building structure. Water & moisture is the source of most foundation problems and is the biggest factor in corrosion of basement reinforcing steel. What to do if basement leaks result in concrete deterioration. What method to use to stop basement water leaks. Despite what many may think – concrete is NOT waterproof. Water can seep through perfectly intact concrete – given enough back pressure. Uncracked concrete - and what concrete isn't cracked? - may reduce the movement of liquid water, however water vapor can still penetrate quite easily. This guide is based upon my personal experience as a Registered Building Practitioner specializing in waterproofing applications and with over 30 years in the construction industry. 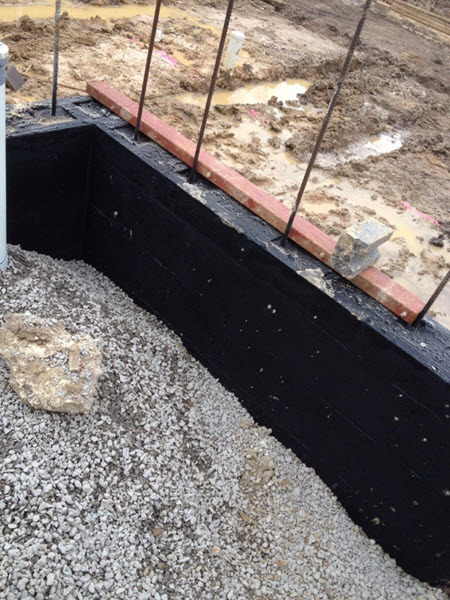 Below ground waterproofing is as important as the very structural foundations supporting a building. Without the combination of sound footings and a waterproofed foundation, a building will deteriorate rapidly. Unlike other building components that might be designed to be replaced several times within the overall building lifetime, below grade systems need to be built to approximate the entire service life of a building. 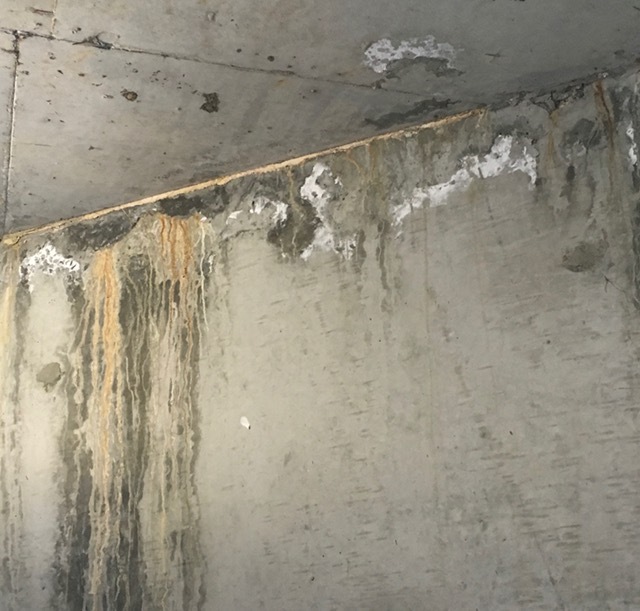 Below grade waterproofing systems often are inaccessible for repairs. This can be extremely costly if rectifications are necessary at a future date. or even possible to fix or upgrade failed basement waterproofing systems. Basement car park - concrete leaching from ROOF water leaks. Keeping basements dry requires the right waterproofing system. Prevent water from moving through walls & draining away is essential to a successful below ground waterproofing system. Starting with construction of the slab floor / wall zone - these areas require a water stop for either tilt panels or block work. 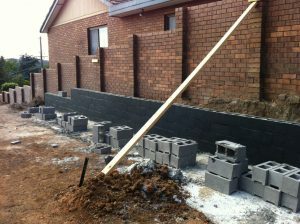 Include crystalline growth compound in the concrete pour of walls or as a fill-in for block work. 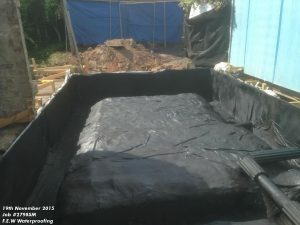 Once walls are constructed, ‘tanking’ with a waterproofing membrane. Prefer LIQUID MEMBRANES for below grade. 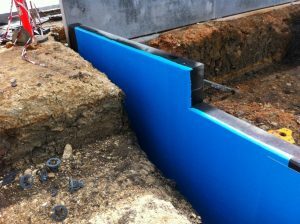 Protect the membrane by installing a suitable barrier prior to backfilling. Essential to the defence strategy is good drainage, for which there are many design options. The waterproofing method used needs to last the expected life-time of the building..
Do not confuse damp proofing with waterproofing ! To permanently stop water and water vapor from entering foundation walls, you need to use a waterproofing membrane. Damp proofing is intended to keep out soil moisture, but not liquid water that enters a basement via penetrations, gaps, cracks, and holes. Waterproofing keeps out both water AND moisture. A GOOD contractor will understand the difference between damp proofing and waterproofing. The cost of waterproofing is initially higher than that of damp proofing. 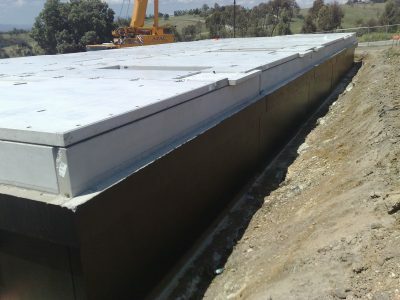 As a building structure ages, the added cost of a waterproofing membrane is well worth the small price difference and will pay for itself in a few years. Damp proofing alone it is NOT a waterproofing system. Damp proofing will only deter - NOT STOP - water from passing through the walls and into interior spaces. The cost of damp proofing is significantly less than waterproofing and hence is used more often. 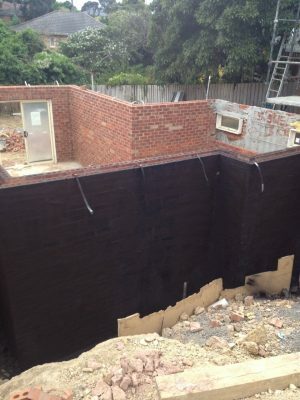 Damp proofing is an inexpensive way to meet the lowest minimum standard of the building code. Damp proofing has little resistance to hydrostatic pressure or "ponding" water. and rarely lasts more than a couple of years. Note – we do not provide Damp Proofing when a waterproofing membrane is required. Waterproof paint should be used sparingly - NEVER as the sole waterproofing method for below ground structures. Waterproof paint is used more as a common do-it-yourself waterproofing method. Applying waterproofing paint to the inside of your basement walls WILL NOT stop water seepage through cracks or porous concrete. Waterproof paint can trap condensation inside the foundation wall - leading to bubbles forming and the paint eventually peeling. This will contribute to bigger and more expensive water problems. Waterproofing paint should be regarded as a cosmetic fix. A true Exterior Basement Waterproofing System keeps water out permanently - and is not just a water management system. Aim is to totally waterproof the exterior walls of below ground structures & eliminate possibility of water penetration. Waterproofing product and method for basement waterproofing should have a lasting effect. 1. Basement Waterproofing will prevent water & moisture from moving through the wall. 2. Drains to control water away from the bottom of the foundation. 3. Robust protection of the waterproofing membrane. Externally applied basement membranes include traditional sheet, Torch-On and Liquid Polymer Coatings. Whatever product used, all external membranes require adequate access to the foundation base and external walls during construction. Careful detailing of any joints, penetrations and service ducts are essential. This last point, unfortunately, is often overlooked!! Purpose of exterior drainage systems is to create a permanent water flow away from the footings & foundations. Drains to control water away from the bottom of the foundation. Prevents water from accumulating and standing against the foundation. Runs to a point lower than the footings - allowing water to naturally gravity feed away. Robust protection board is an essential part to a basement waterproofing system. This protects the membrane before backfilling. Excellent resistance to standing water & hydrostatic pressure. Flexibility & Elongation - will expand with the building envelope settles. Spray application creates a seamless membrane – no joins or seams to come apart. Extreme expansion and contraction without cracking or becoming brittle. Liquid will seal around all concrete & blockwork penetrations, holes, gaps etc. Crack spanning capabilities to resist hydrostatic pressure. 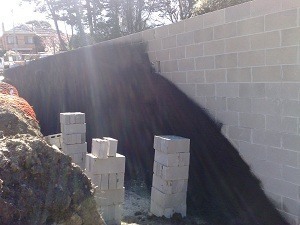 Applied to green (uncured) concrete walls immediately after forms are removed. Compatible with a wide range of drainage, protection, and insulation boards. Internal Controlled Water Management is another waterproofing system for basements. Internal Waterproofing can be used alongside external systems - especially if a habitable room. An interior drainage system addresses hydrostatic pressure, or the pressure of groundwater forcing its way through the basement walls. A drainage piping is installed in the interior perimeter of the floor - routing water that enters the basement to a sump pump system that actively removes the water. A backup battery-operated sump pump is often recommended to prevent flooding of the basement during a power outage. 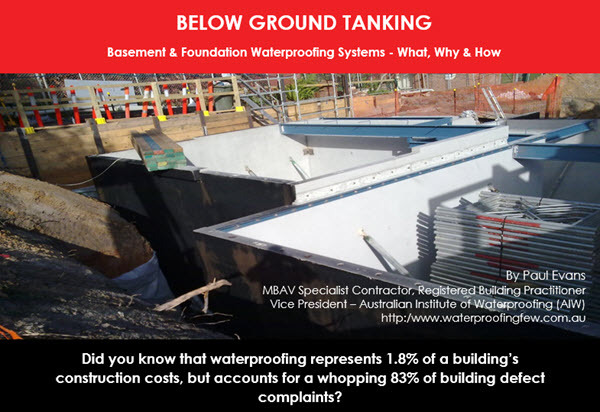 Internal Systems are also an option for remedial basement waterproofing when it is not viable to excavate the external membrane.